After our morning adventure at Monet’s Garden (see here) the time had finally come to go to Paris. We had spent the first 7 days in Europe in much smaller European cities, so the booming metropolitan centre of Paris was bound to be a change. 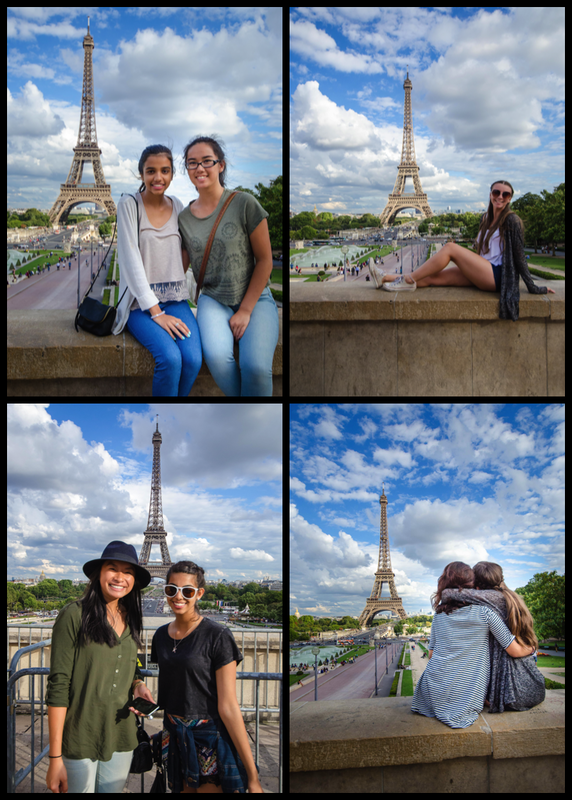 Famous for art, food and the Eiffel tower, the kids were very excited to finally see the city. There was so many sites (and so much walking) waiting for them – just 75 minutes from Giverney. Adri, our driver, was a master with our giant bus. But not so much with the GPS. He plugged in our destination, not realizing that it would take him through a series of small towns – many of which had narrow streets with tall buildings on each side – making it impossible for us to turn any corners. This meant to had to take out a few garbage cans (and bump a car or two) before we made it back on to the highway and into the city. Adri drove that bus like it was a small European car – which was both entertaining and, sometimes, frightening. But after a little bit of maneuvering, we made it out to the highway, and very soon, into the Montparnasse region of Paris (the 14th arrondissement) – to our home for the next 4 nights at Ibis Maine Montparnasse. We didn’t spend much time at the hotel – we walked through the door, threw our bags on our beds, and 15 minutes later were back out the door! 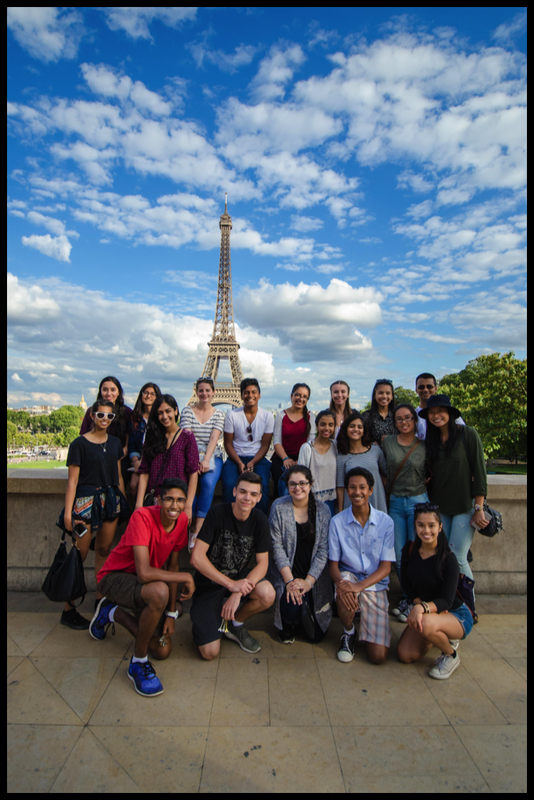 Ms. Kenkel took 6 of the students down to the Champs-Élysées where they spent the next few hours shopping. 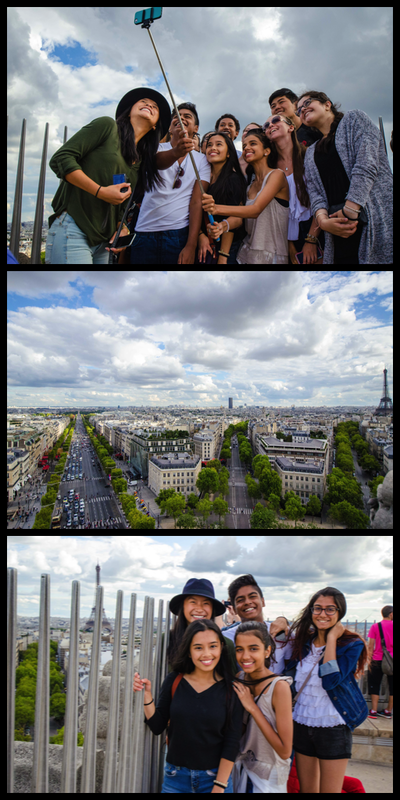 And I (along with Mr. Becker and Mr. Dewinetz) took the remaining 20 students to the Arc de Triomphe and the Trocadero. This was the first time I had been to see the Arc de Triomphe. 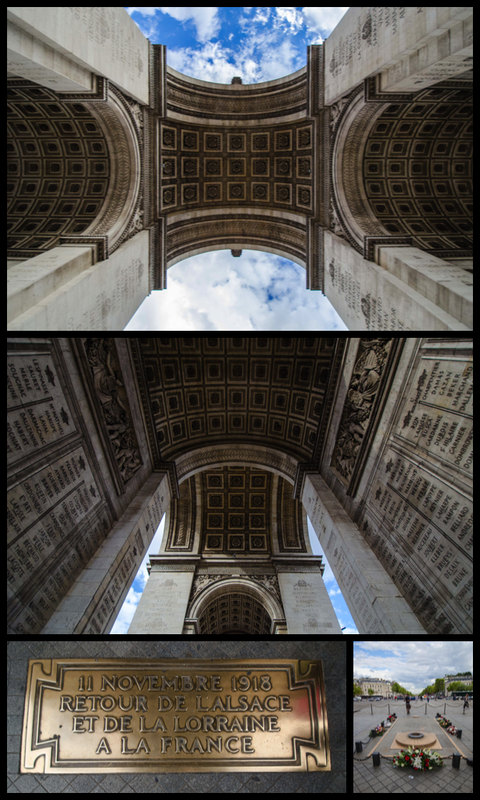 The “Triumphal Arch” is one of the most famous monuments in Paris. It stands on the west end of the Champs-Élysées in the centre of Place Charles de Gaulle. It is a monument to honour those who died for France in the Napoleonic and French Revolutionary Wars; it also contains a vault underneath that is the Tomb of the Unknown Soldier, honouring those without a grave that fell in World War I. On the ground is many plaques in honour of important dates, military events, and victories. On the outside of the Arc you will find carved the names of great battles and great military leaders, and images depicting 6 famous battles. 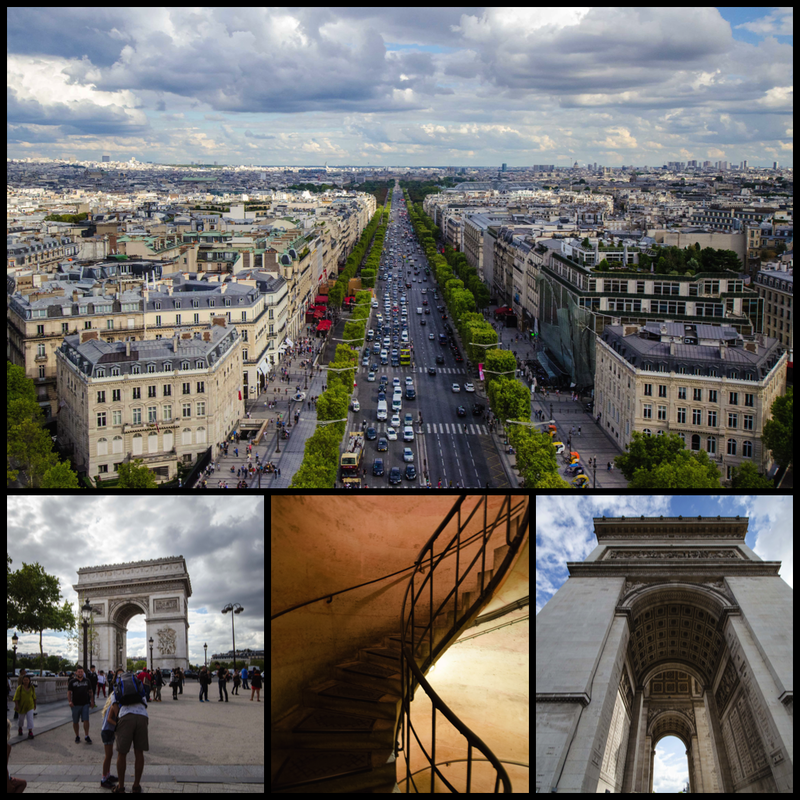 It is 284 steps to the top of the Arc de Triomphe, from where you can see the 12 radiating streets that converge at the Arc – like spokes of a tire. And the views of the Eiffel tower are equally breath taking. I can guarantee it was worth the hike to the top. This was the first real moment where our group got to sit, savour and breathe in Paris. Wide-eyed, they drank in the views, before we walked back down and headed to our second destination. We took the metro from the Arch to the Place du Trocadero (or just, Trocadero). Here you will find the Palais de Chaillot. The hill of Chaillot was first built for the world fair in 1867. For the world fair in 1878 they build the Palais du Trocadero (meetings of international organizations met here during the fair). The old Palais de Chaillot was demolished and rebuilt in 1937. It went through a phase as an aquarium, it had animal statues that were then relocated to outside the Musee d’Orsay, and now houses a naval museum and ethnology museum. It was temporarily the headquarters for NATO, and famously a site that Hitler stood in 1940 during WWII. What is it to us? As far as I’m concerned – it’s the best view of the Eiffel Tower in the city. The garden and fountain below are stunning, and provide marble columns to sit on and take in the views (as a few of us will do later in the trip!) Our stop here was simple. Take pictures. We were in Paris!! And what picture did everyone want? The one in front of the Eiffel Tower. Except the Eiffel tower is huge! So you need to be far enough away to get the whole thing in. And I knew just the place. So we set up shop, and let everyone snap snap snap away. After 30 minutes off photos, we corralled the students to head back on to the metro to meet the shopping group at our next destination – dinner!! We had a 2 course crepe meal – a savoury dinner crepe followed by a sweet dessert crepe. After dinner we had one more stop – a nighttime boat cruise up and down the Seine. Paris is known a “The City of Light” – and this was our first chance to see that as true. We floated past Notre Dame on Ile de la Cite, past the Louvre and Musee d’Orsay, the Conciergerie and of course, the Eiffel Tower. From the water the city appears quiet and beautiful – a perfect way to end our first day in Paris. A total of 14 km of walking and 4 metro trips, we finally made it back in our hotel – about to watch the clock strike 12 and ready for a good nights sleep! !